Keep Moving: low impact activity not to let your muscle seize and not to let them go into a state of shock. Favorites are walking, a light jog, and for adventurers out there, a Zumba class. I significantly rely on yoga and walking. Jennifer Faraone practicing what she preaches after winning The North Face Endurance Challenge New York Half-Marathon in May 2015. 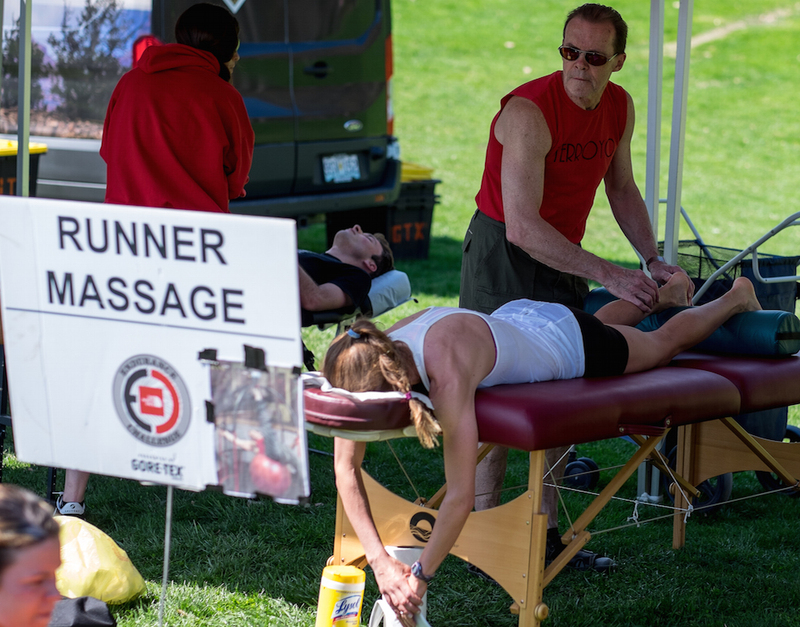 Self-Massage via Foam Rollers: all kinds of foam rollers are widely available and especially useful in conjunction with YouTube videos on how to use them to aid in the recovery. After a race, nothing beats foam rolling to relieve and stretch gluteus muscles. Nutrition + hydration: stretching and massage is all good but your muscles need love from the inside too! Most people seem to be able to stomach a post-workout smoothie, a banana, peanut butter or an energy bar. Electrolytes are key as well and once all that’s figured out and the stomach settles, wine and beer seem to be among the top hydration choices! I personally love a hot, black cup of coffee. Hot + Cold Therapy Ball Rollers: helps to relieve tension in those poor feet by increasing circulation and massaging. I’m obsessed with Gaiam’s Hot and Cold Therapy Kit, because it’s versatile and costs $20. Downward dog with top of the feet stretches: a spin on the old favourite downward dog, that lengthens all main muscle groups, is to flip your feet to get a stretch them out across the top. For a more comfortable alternative, you can stretch one foot at a time while staying in downward dog. Rather than stretching both feet at the same time, get into a downward dog and then stretch the top of each foot on its own. It feels so good! Compression socks / sleeves: most runners experience tight calves sometimes a day after a long run. If they’re super tight, a deep tissue massage is certainly the best but if you’re just looking to prevent the morning after tightness, try sleeping in compression socks or sleeves. Pigeon pose: flex the front leg and push the left hip down into the ground. If you need a deeper stretch, you can put your upper body on top of the front leg. Runners Lunge: has become my personal favourite because it has so many variations that even the least stretchy person can do. It’s ideal for gently relaxing tight muscles. If you have any additional tips and tricks that help you recover from a long race, please share them in the comment section!